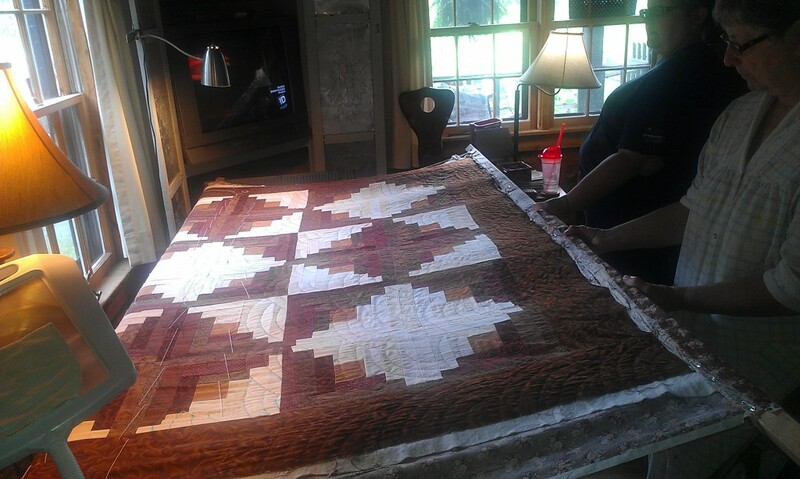 Another Hatchett Job... | A Quilt for Hubby and Me! Log cabin quilt in the log cabin! A couple of years ago, I had the opportunity to take a set of classes with Pat Wys of The Silver Thimble Quilt Company. The classes were so wonderful! Pat is a fantabulous teacher and I learned so much about how to make my piecing and quilts so much better. I really hated it when circumstances forced me to stop attending. Now, Pat no longer teaches my local (well, kind of local) quilt store and I miss those classes. But, anyway, this is a quilt that I made from a pattern called White Chocolate that Pat designed. Each class, we had a choice to bring something of our own to work on or we could purchase one of Pat’s patterns and a kit made up by the quilt shop. This is one of those quilts. Of course, back when I started this quilt, I was looking to improve my skills, not being terribly concerned about the fabrics. I remember seeing it and thinking, “Ooh, that’s masculine” which isn’t often stated about many quilts lately. The fabrics can tend toward the crazy frou-frou. And, hey, I like some frou-frou! But, this one was striking, but terribly different from anything that I had ever picked out. Pat’s pattern showed a monochromatic look of creams, caramels, and khakis. But, this monochromatic quilt kit offered such amazing drama with the increased contrast of the fabrics. Little did I know that I would end up living in the log cabin while quilting away on this beauty in a homemade quilt frame. The quilting pattern is a free form Baptist Fans (sometimes called Methodist Fans or Church Lady quilting). I am marking with a water soluble blue marker one row at a time so Mom and I can both work and know for sure that we are working in sync with it even if the other is not around. It goes fairly quickly and easily (more quickly when I actually make myself sit down and work on it!) and is not difficult to do while watching a bit of television or a movie. My stitches are nothing to write home about and, since I am quilting with YLI Rust quilting threads, I cringe a bit when I see imperfect stitches (all of them!) against the pale cream background, but when you step back a bit it isn’t jarring at all. You don’t see individual stitches, just the movement of the pattern. Those are the moments when I can’t wait to see what the end results will be! I am hoping to get quite a bit done this weekend as most of my family is travelling. Mom and Dad are off to her 50th class reunion and Hubby and the boys are camping and whitewater rafting. It’s just me and the Army brother who is home on leave, who drifts in and out occasionally. Mom occasionally laughs that we need to finish the quilt so we can put up the Christmas tree when time comes. I want this baby on my bed long before that time comes! It almost feels kind of prophetic, the road that this brown log cabin quilt and I have travelled to end up in our log cabin. It just feels right to me.